The last link post was actually three weeks ago, for any of you keeping score at home. Since then we’ve had an exciting #Refo500atDET series (links to individual posts below) and not much else. That series was a lot of fun to put together, though, and I hope you enjoyed it. If you have not yet enjoyed it, now’s your chance to catch up! So, my book on Helmut Gollwitzer is out! 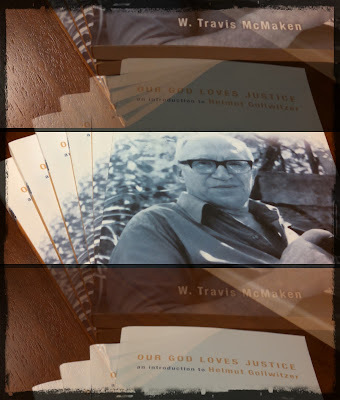 W. Travis McMaken, Our God Loves Justice: An Introduction to Helmut Gollwitzer (Fortress, 2017). I've mentioned this once or twice indirectly here at DET, but this is the first time that I've posted about it specifically. But I definitely want to, because I definitely think that you should order the book. And the price-point is definitely reasonable, even if I definitely say so myself, which I definitely do. Definitely. But rather than continue to type excited gibberish, I want to share with you the Amazon review of OGLJ that Susan Vincent wrote. Susan is a lawyer who does what sounds like very interesting work in community development both in the US and abroad. I've gotten to interact with her some on Twitter (@susanv) and she seems like good people. Plus, she likes my book, so she's definitely good people. Definitely. Not a bad title, I think, but not entirely honest either. You see, I tend to think that Calvin is not only properly understood as Luther’s disciple, but as Luther’s chief disciple. But that’s a whole other claim that I don’t want to get into today, so the title stays as it is. In case you don’t like that engaging little introduction to the post, here’s another. Free of charge! Best 2-for-1 deal in the theoblogosphere today! Hang around DET long enough, as long-time readers know, and eventually I’ll write yet another post about Calvin and Luther. I’ve included a little index of those posts at the bottom of this post, for your browsing convenience. Today is a little different, however, because I want to talk about how Spijker (Calvin: A Brief Guide to His Life and Thought [WJK, 2009])—correctly, in my humble opinion—understands Calvin as a student or disciple of Luther. Calvin is one of those figures who accomplished such an incredible amount of intellectual work that from time to time one just has to take a step or ten back, get a good view of the lot, and stand in awe. And that awe is only increased when you consider how powerful the content of that work has proven through the centuries. 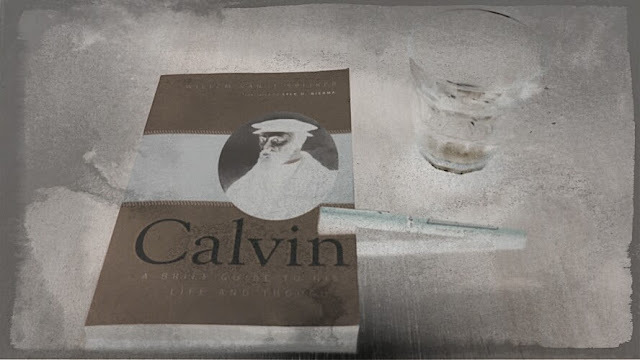 Spijker’s book Calvin: A Brief Guide to His Life and Thought (WJK, 2009) provides some insight into the production of this oeuvre and the brain that produced it. Won’t you join me in getting to know this side of Calvin a bit better? As always, bold is mine. I’m sad to say, gentle readers, that your intrepid theological bloggers here at DET found themselves unable to give adequate attention to all the major figures from the Reformation. But then again, savvy readers that you are, you probably aren’t surprised. But there are a number of folks that I want to include even if I lack the necessary resources to give them their own posts. Remember that old Kenny Rogers song where Kenny (I presume) meets a gambler on a train bound to nowhere? After bumming a ciggy and Kenny’s last swig of whiskey, the gambler shares an important life lesson he’s learned in plying his trade. Know when to run.Yeah, if you didn’t before, now you know the song I’m talking about. And if for some odd reason you still don’t, or you just need a refresher, check out the 1978 music video. It’ll enrich your life, and it’ll help you understand Thomas Cranmer. I begin with this because the career of Thomas Cranmer (1489-1556), the great “architect of English Protestantism,” can be seen, among other things, as a proleptic anticipation of Kenny Rogers’ “The Gambler.” To make any real progress in the tumultuous political environment of 16th century England, the Reformation needed someone like Cranmer — someone who knew how to play the game. Martin Bucer was the referee of the Protestant Reformation. He worked to solve conflicts between figures like Martin Luther, Ulrich Zwingli, Philipp Melanchthon, and John Calvin. Bucer was born on November 11, 1491 in Schlettstadt, Alsace, and died in England on February 28, 1551. That means he not only lived through the dawn of the Reformation, but—unlike Luther—he also lived to see the Reformation’s darkest hour during the Interim(s), but not the decisive Peace of Augsburg in 1555. #Refo500atDET introduction & schedule available here. Welcome back for the second of my post discussing the contributions of women to the Protestant Reformation (#Refo500atDET introduction and schedule here). I focused in part 1 on some of the women who provided important material support for the Reformation by marrying key reformers. Today, however, we're talking about some women who contributed to the Reformation movement through teaching and writing.